59% of all Americans say women are respected in the U.S.
WASHINGTON, D.C. -- This International Women's Day, Americans are less likely than ever to say that women in their country are treated with respect and dignity, and they are falling even farther behind their peers in Western Europe and Canada in this regard. A record-low 59% of Americans in 2018 said women in their country are treated with respect and dignity. This is down sharply from 68% the previous year, with most of the slump coming from U.S. women -- among whom less than half (48%) currently feel U.S. women are treated with respect. 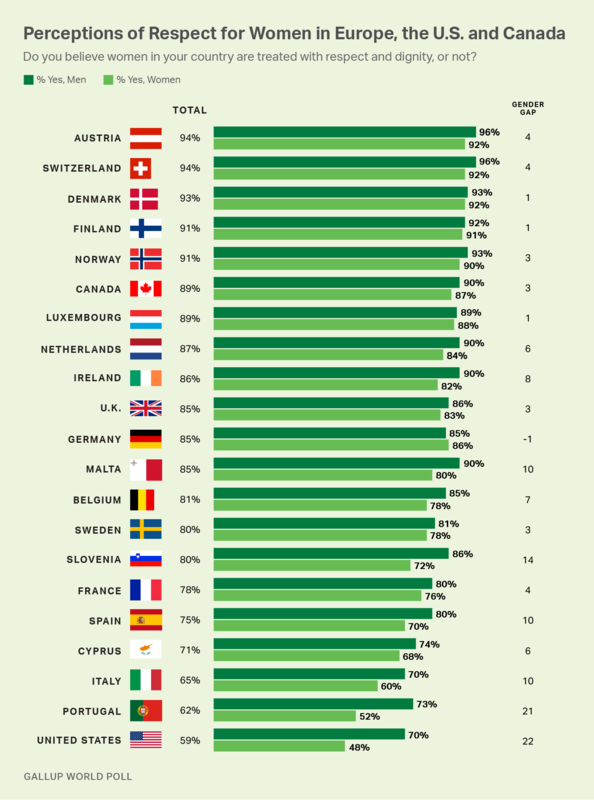 Among 21 Countries, Views of Respect for Women Lowest in U.S.
Across 21 countries spanning Western Europe, Canada and the U.S., the perception that women are treated with respect and dignity ranges from 59% in the U.S. to 94% in both Austria and Switzerland. Residents of Denmark (93%), Norway and Finland (both 91%) were also nearly unanimous in their agreement about whether women in their country are treated this way. At the same time, Portugal (62%), Italy (65%) and Cyprus (71%) join the U.S. as the only countries surveyed with less than 75% of residents rating their country as respectful of women. Globally, women are less likely than men to say that women in their country are treated with respect -- and for the most part, that trend holds true in these regions. The U.S. and Portugal have the greatest gender gaps (more than 20 percentage points) in perceptions of whether women are generally treated with dignity and respect. Americans' views that women in the U.S. are respected fell nine points between 2017 and 2018, mostly reflecting a 14-point drop among women. This decline, which is similar to other Gallup findings, coincided with a torrent of sexual misconduct accusations against high-profile men in the U.S. that resulted in the #MeToo movement's explosion. The gender gap in the views of Portuguese residents, conversely, did not change substantially from 2017 to 2018. Perceptions of respect for women in these regions are closely tied to views about how respected and safe residents personally feel. Across the 21 countries surveyed, an average 93% of residents say they were treated with respect the entire day prior. Unlike the question about respect for women, men and women within each of these countries have similar experiences of personally feeling respected. The largest gap between men and women does not exceed four percentage points. A separate reading on how safe residents feel walking alone at night is marked by greater gender differences. In all, reports of personal safety range from 62% in Italy to 92% in both Norway and Slovenia, and the average gender gap among all 21 countries is 15 points. Among those who say they were not personally respected the entire day prior, perceptions of feeling safe in their community are low. When people believe they are respected, they tend to report feeling safer and they also share more positive views of how women are treated in their country. When comparing men who feel respected with men who do not, there are sizable gaps in their perceptions of safety, ranging from 21 points in the U.K. and 20 points in France to Belgium, where there is no meaningful difference. In contrast, when comparing women who feel respected with women who do not, the gaps in their perceptions of safety range from 30 points in France and 27 points in Germany to relatively small gaps of five points in Italy and Cyprus. As people across the globe rally in celebration of International Women's Day this year, support for women's rights will once again be one of their central themes. Respect for women within their community is a foundational element of gender equality. Views of respect for women across Western Europe, Canada and the U.S. are closely tied to each country's own residents' feelings about how safe and respected they personally feel. 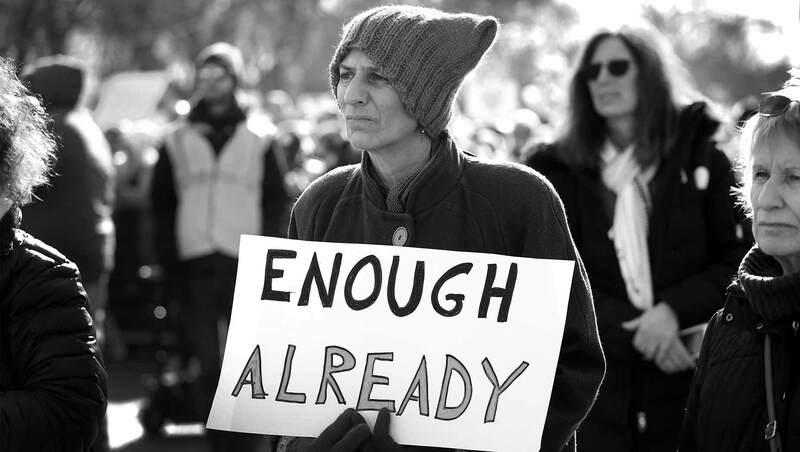 In the U.S., gender equality issues are particularly poignant in light of the #MeToo movement -- which has helped expose issues of harassment and disrespect, as well as issues of violence and physical danger that women uniquely experience. As women's rights advocates work to create greater respect for women globally, the populations of some of the wealthiest and seemingly most progressive countries in the world may present some of the best opportunities to begin making improvements for women. These results are based on telephone interviews with at least 1,000 adults per year, aged 15 and older, in each of the countries in Western Europe, Canada and the U.S. in 2018. For results based on the total sample of national adults, the margin of sampling error ranges from ±3.5 percentage points to ±4.0 percentage points at the 95% confidence level.